Yeah I find those diets really disturbing and it's even more disturbing it seems to be the norm so you can say: Hello eating disorder for life. I laughed so much with some of the comments here and the pics..I mean, I feel bad to laugh about that but is the truth, some guys wear more makeup than the female actress, and it's such a turn off. I always see how much it bothers you the chapped lips, and you always mention that when you see it in a drama, and it seems it's just getting worse like if chapped lips is in style now in Korean dramas. What bothers me the most is when the girls have big ears and instead of hiding them with their hair, they make them pop out of the hair and they look huge (almost like a monkey's ear I swear). I tell my daughter if I had ears like that I would glue my hair so they have no chance to pop out. The surgery is not costly ( at least not here in US) they use surgical glue or stitch them up. I've seen several people with this kind of surgery and they go home in 2 to 3 hours (recovery is longer than the surgery itself lol). I have seen several actress/actor that look worse after plastic surgery, and I wished they never had it done bc they lost their real beauty.. I think that cosmetic surgery should not be to look like someone else, it should be to improve simple flaws without losing the real you under a butcher's knife (called plastic surgeons). There are 3 girls that looked exactly like SuzyA, and now Suzy no longer looks like herself. I use to find her naturally beautiful but now I don't recognize her when I see her in pictures bc she changed so much. She destroyed her natural beauty and it makes no sense to me. I had a cousin that refused to lose her beauty, and during her third plastic surgery something went terribly wrong, and she was in a coma for 2 weeks. Her biggest punishment for her vain attitude? The medicine they gave her during her coma made her look like a ''weird doll'', her cheeks were so puffy you could hardly see her eyes. After months of suffering and not allowing any of us to visit her she died from complications. She instructed her daughter that her funeral had to be with close casket bc she didn't want ppl to see her ''looking like a monster'' Since I wasn't able to see her, I really don't know how she looked except for what her son in law was telling us at the funeral home. I feel these actors/actress go along with everything they are instructed to do, and that's really sad. and in a Music video. Doesn't he look infinitely more handsome without that deep red colour? Agree...such a cutey with more lipstick than his love interest next to him lol. On first sight he looks like a girl with short hair... I wonder if they get payed for using lipstick so obviously, 'cause girls might want the same colored lipstick their Oppa had on? I really don't think that's the main reason bc why not put that color on the female actress lips? I swear I think this is done purposely to the male actors for whatever sick perverted reason those writers, producers and directors etc... might have, bc they must know that no girl in their right mind is going to like to see her cutey guy with so much lipstick on. It's not even subtle so that it can be overlooked and acceptable at least. I see this going on now even on older male actors, and is not attractive to me at all. Turns me off completely and kills the romantic scene feeling. If I was a young girl to see a guy with so much lipstick in a romance drama, that would be a total turn off for me, and I would be complaining from left to right about it in the comments section. I wish there was a logical reason/explanation for this. A couple of years back (2012/2013?) they were using a new camera that gave the actors a deep yellow color in their skin, and I remember thinking they might have a liver disease like Hepatitis C. I read an article about comments from viewers complaining a lot and asking if the actors were sick Later on, I read many articles explaining that it was a new camera they were using that caused the yellow skin color in the actors/actress, and that they were not sick. Maybe, this is what's going on now bc I also noticed that the male actor's very white skin, looks now very pinkish and sometimes ''red like if they had a bad case of rash--'' Has anyone noticed this also? Sometimes there will be a lipstick concept for ALL characters in a drama. See The Undateables. Not only the main leads and the second male lead, but all the secondary actors as well are wearing orange lipstick, the same shade, in every single episode! Which may be toned down compared to fuchsia, it's less a punch in the face, but still it's more unnatural in its own way, because in reality there are people with very pink or red lips, but I've never met anybody with orange lips. And you can also see a "fine" example of female chapped lips here. The poor actress is plain enough as it were, her stylist must hate her. The hair, the lips, the outfits... Why didn't they pair Namgoong Min with someone more in his league? Why men couldn't wear color lipstick ? I don't really get the problem even if not natural + they often wear eyes makeup as well. The only thing is sometimes it's poorly done. I saw Shindong in SuperTV wearing a very dull fondation, making him look like a corpse. I love pale skin but his makeup wasn't bright so it looked weird. Well, to each his own. After all there are men who like to go around dressed as women, right? I personally find it disgusting in a man who professes to be straight and okay with his given gender. But I also understand that the Korean public obviously likes it, otherwise they would not do it in dramas. Just as the partly coloured lips in women, which I find utterly ridiculous and unattractive. And the flood pants leaving the ankle bare, without socks. And the "clown style" for women's clothing: baggy short pants with suspenders and some blouse underneath, men's chunky shoes. But that has been the Korean taste for so many years now. Fashion things are nothing compared to behaviour such as eating with open mouth, all the contents visible, spitting food here and there etc. (I have learned to not eat while watching k-drama, there's bound to be a sickening scene like this somewhere). And/or a drunken scene ending in vomit - to strengthen the romantic bond of the two main leads. However, these dramas were made firstly for Koreans, not for us, so they don't have to cater to our tastes. If we love dramas and want to watch them, we have to endure it. This said, we are allowed a little rant every now and then, aren't we? After all, lately Asian broadcasting companies take a lot of money out of foreign sales as well. In my case, I like my man to look like a real man, not almost a woman with so much makeup on. If you are okey with that more power to you. But I can't get turn on in a romantic kissing scene, seeing this ''man'' with so much makeup on (especially eyeliner and lipstick). I guarantee you, I won't watch a drama if the guy has excessive eyeliner and lipstick. I get that it's your taste in men, and that some people don't find it attractive. I agree with you. When it's poorly done it just distracts you from the performance. Quite a pity. Also, I don't know why I forgot this, but in different Asian countries certain groups in society have been known to wear make-up throughout history, f.e. the aristocracy in pre-Korea or even in China. Maybe that's why they don't have trouble with wearing cosmetics while countries without that history might see it as weird or not masculine. And I roll my eyes every time the cliche wrist-grab comes into play. Unfortunately, it still happens way too much in drama's. Maybe that's why they don't have trouble with wearing cosmetics while countries without that history might see it as weird or not masculine. But, by the end of the 18th century, that fashion was deemed too extravagant, frivolous and effeminate, and started to be abandoned. Actually they went to the opposite extreme, and by the middle of the19th century men's clothes were dead boring! from 1870 to the1970s men were allowed only neutrals, preferably dark (black, grey, dark blue etc), without any decorations. Yawn! 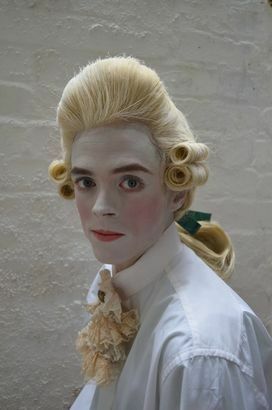 To come back to your tentative theory, the fact that once men's makeup was fashionable doesn't make it less ridiculous for us Europeans to see a man looking like this today. Why more men are wearing makeup than ever before. And here one with statistics from Huffington post. But I still find male makeup a major turn-off. Not sure if the same holds true for some Asian countries. And I'm not trying to invalidate your opinion of male make-up. Just trying to think of reasons why these cultural phenomenons pop up in some countries, but not others. By the way, now I'm curious. In East Asian countries (Korea, China, Japan), surely male makeup was not "a thing" for most of the 20th century, right? Even if it was done in much older centuries. I cannot imagine men in the 1950s or 1960s doing it. Or did they? I think not, but weren't they just recovering from the war? (WWII, the Korean War, etc). Also, by that time they got heavily influenced by American (Korea) or German (Japan) culture, right? I remember doing my history exam (which was a while back ) on beauty in Japan, but I focused more on woman and after WWII it wasn't even that popular for women to wear make-up. Also, led in make-up was a huge problem.